VOLUNTEER AT 'THE COMPASS': Several local church congregations support the work of The Compass, whose mission is to help members of our community who may be experiencing economic, social or emotional challenges. The Compass runs a food bank as part of their ministry/service. The Compass urgently needs committed people to work in the following areas: hospitality, shopping with clients in the food bank, cleaning, sorting and repackaging food, stocking shelves and much more. Orientation/training is provided and shifts (2-3 hours) are flexible. The Compass is located at 310 Lakeshore Road West (map) in Port Credit. Call (905) 274-9309 to volunteer. 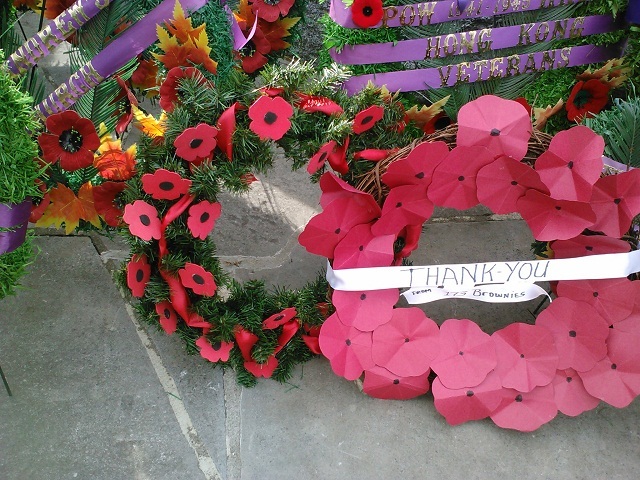 Shown: Wreaths laid at the Port Credit Cenotaph on November 11, 2012 (enlargement). ► Click to view the 70-slide PHOTO ALBUM on the TOPCA Facebook page. PORT CREDIT POLAR BEAR DIP: Tuesday, January 1, 2013 @ 2 p.m. at LAKEFRONT PROMENADE PARK at the foot of Hampton Crescent south of Lakeside Avenue (map). This year's Dip is a fundraiser for cancer hospice Ian Anderson House. PLAN YOUR PLEDGES NOW. Annual charitable New Year's Day dip in Lake Ontario is sponsored by The Brogue Inn (website). Call (905) 278-8444 -- Tommy Donnelly, proprietor. PLEDGE SHEETS available at The Brogue's main bar at 136 Lakeshore Road East (map). Nurses and firefighters on hand. Afterwards, live auction and fun at The Brogue. ► Mississauga News article (Jan. 1, 2013): Come on in, the water's lovely. Click for some ch-ch-chilling PHOTOS taken on January 1, 2009 at Lakefront Promenade Park (point of entry) by Port Credit photographer Sean Murphy. Mississauga News article (Jan. 2, 2010): Frigid fun for a float. January 1, 2011: Click here for FLYER. On March 28, 2012, Council voted unanimously to re-name the Cawthra Community Centre in Lakeview District after Carmen Corbasson, who passed away on March 10, 2012. ► See the photo source webpage of the structural engineering firm which completed the new Cawthra Community Centre project in 1999. Photo below: Carmen was a great supporter of TOPCA's painted bike project, initiated in celebration of the 175th Anniversary of Port Credit in 2010. Here Carmen speaks at the Farmers' Market in June 2010 beside one of our first bikes. Carmen encouraged us to paint the bikes as brightly as possible, thinking that that blue and green paint given to us by the City wasn't wild enough for the nature of the project. We will be re-painting the bikes this Spring! ► Mississauga News article (March 10, 2012): Carmen Corbasson dies after surgery. Excerpt: "Carmen Corbasson, who became synonymous with grassroots representation in her 27 years working in the Ward 1 council office at Mississauga city hall, died at 8:30 this morning of complications from surgery."